Of course, you might not have time to track down an outgoing Oklahoman. Not to worry. A quick visit to the Landrunnersï¿½ Web site (okcrunning.com) will provide a number of options in town and nearby, from the new Oklahoma River Trails (recommended only during daylight hours) to the secluded, affluent neighborhoods of Nichols Hills (where the 25 mph speed limit discourages motorists, making it a nice choice for runners). But if you poll the clubï¿½s members, as Snipes did, the overwhelming favorite would be the Lake Hefner Trails. Situated six miles northwest of downtown Oklahoma City, wedged between the Northwest Expressway and Lake Hefner Parkway, this municipal water supply is surrounded by a 9.1-mile multiuse loop that rims the shoreline. With its expansive views, a well-maintained trail, invigorating breezes coming off the water, and plenty of company, Lake Hefner is about as perfect a running destination as youï¿½ll find anywhere. There are trail markers every half mile, as well as strategically placed water fountains and portable toilets. The trail itself, completed in 2002, is pancake-flat, and the surface is mostly asphalt with extended stretches of concrete. For those who prefer a softer running surface, much of the trail has grass shoulders that will afford your joints more cushioning. You can run the trail in either direction, since the ubiquitous trail markers are printed on both sides. For this jog, head west, or clockwise, from Stars and Stripes Park. That’s the beginning and end point of the trail marker legend — and the most popular parking spot. 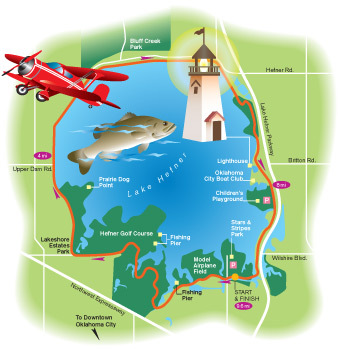 The first mile from this point is fairly wooded, hugging the convoluted south shore of the lake (which features a model airplane field and a fishing pier) before passing through the Hefner Golf Course and veering north at Lakeshore Estates Park. Just past Prairie Dog Point, from roughly 9 o’clock to 1 o’clock on the Lake Hefner dial, you’ll run along the top of the lake’s dam, on Upper Dam Road. This area is highlighted by the exceptional panoramas that the Midwest is famous for. From the northern section of the dam, you’ll see Bluff Creek Park, which has a number of single-track dirt routes favored by mountain bikers and trail runners, since their location offers a bit of a shield from the wind. Shortly after stepping off the dam at around mile seven, along the eastern shore of the lake, you’ll stride past a small park with toilets, water fountains, and shelters before passing a string of superb shorefront restaurants, including the Redrock Canyon Grill, Bahama Breeze, and Pearl’s Lakeside Seafood Grill, and eventually reaching the Oklahoma City Boat Club. The parking lot by the boat club and restaurants is another good spot to start a run, since it provides an enticing reward when you finish. Those jogging in the evening might catch sight of the often-spectacular sunsets to the west, across the lake (servers at the Redrock Canyon Grill cheer wildly and one rings a cowbell the moment the sun hits the horizon line). If you’re particularly lucky, the clouds overhead will provide an unmatched canvas of pastel colors, with rich hues of pink, peach, orange, and red. After the boat club you’ll pass a children’s playground, which is a fun option for runners traveling with their families (parking, again, is available here). From there, it’s a short sprint back into the woods to Stars and Stripes Park and the finish line. Travelers visiting Oklahoma City in April might consider participating in two of the biggest events on the area’s running calendar, the 25th annual Redbud Classic (redbud.org) April 14–15, and the 7th annual Oklahoma City Memorial Marathon (okcmarathon.com) on April 29, which begins downtown and loops around Lake Hefner, returning through Nichols Hills. ©2010 Copyright The Landrunners Oklahoma City Running Club. All Rights Reserved. Landrunner Mission: To support health and fitness of all ages through recreational running.